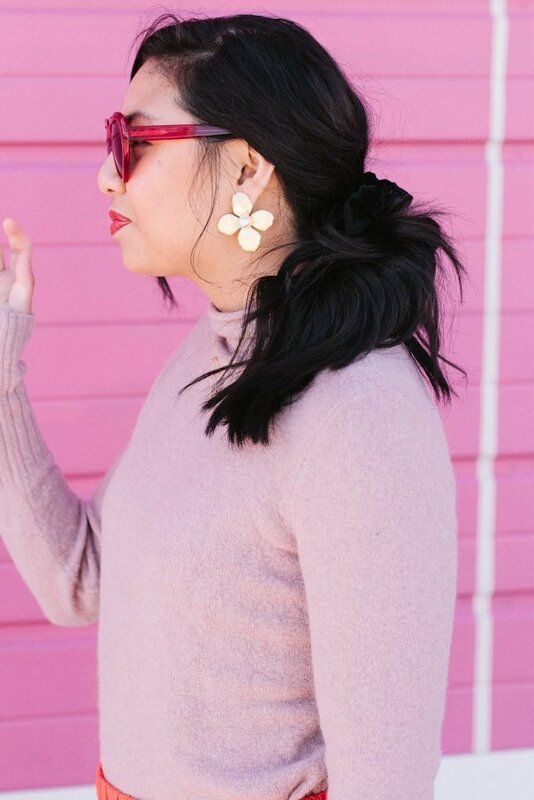 Spring transitional outfit Or Valentine’s? What do you think of this outfit? 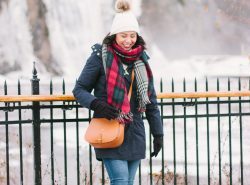 Do you think this is a Spring transitional outfit or Valentine’s Day Outfit? What comes to mind first? I bet Valentine’s Day outfit came first, probably because it is only a couple days away. Honestly, when I created this outfit, I had Spring transitional outfit in mind. With my “I’m so over Winter” attitude, I just wanted to create an outfit that was vibrant, happy, and screams Spring without freezing my legs. One of my favorite color combos to create is pink and red. I love that they’re somewhat in the same hue color range, yet they look quite opposite at the same time. Overall, I just enjoyed that it has a very feminine feel to it. 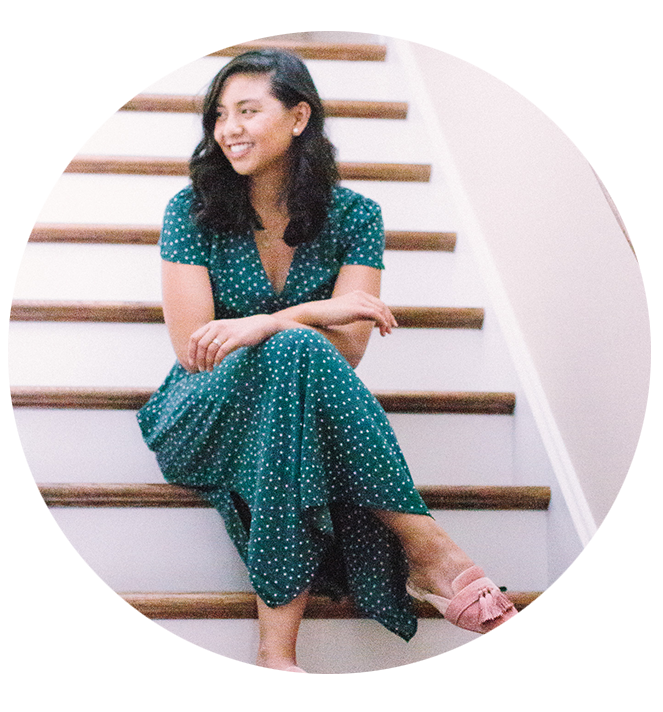 I knew creating a transitional look would be the perfect opportunity to bust out any wide-leg pants. 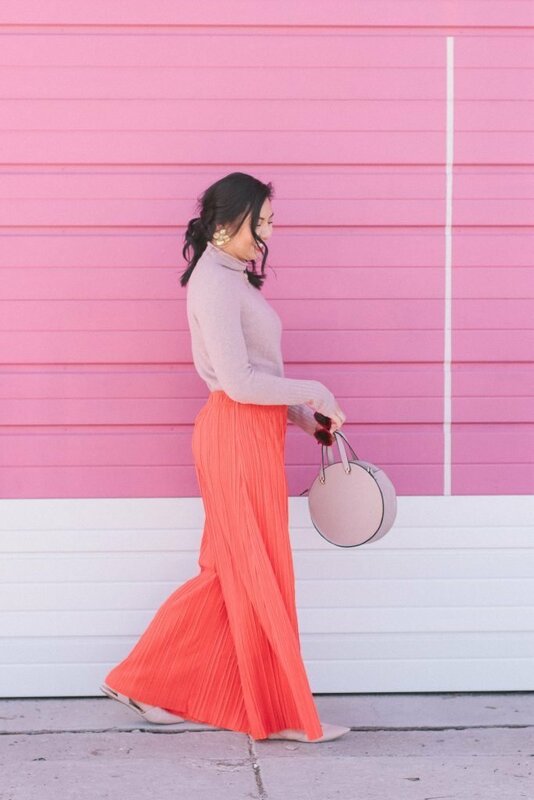 You all know, I’m a sucker for wide-leg pants, especially pleated ones! The wider the better. 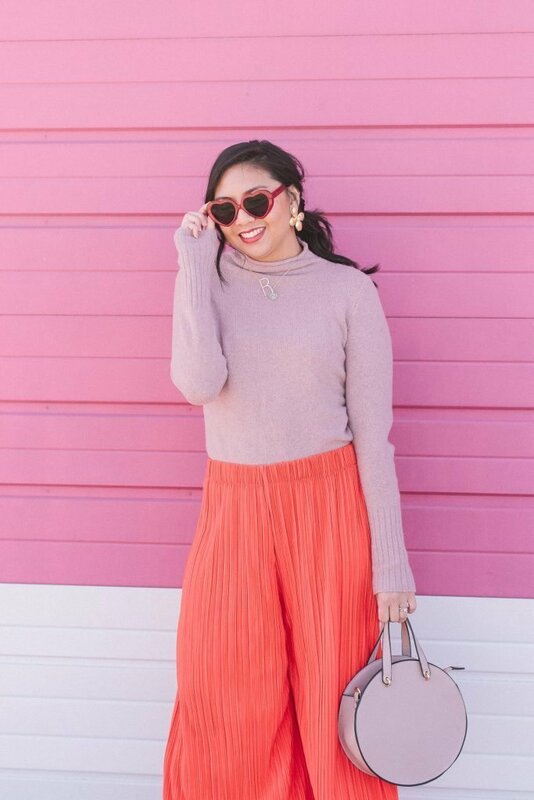 These pants cover your legs (layer with tights for extra warmth), but they also can be cool enough for Spring temperatures. I personally think sweaters will be worn until mid-June. That’s Chicago for ya! If you are interested in these pleated wide-leg pants, I’d say they fit slightly large. I’m wearing a size small, and it’s loose, but not loose enough to fall off. It’s supposed to be high-waisted, but it’s sitting higher than the hip area. I guess they call that mid-rise fit? I think if I ordered an XS, it would be high-waisted. So I was a little disappointed in that. 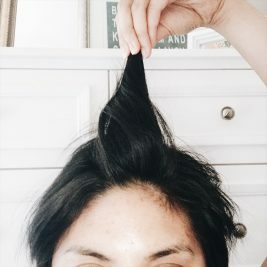 However, the length did not need any hemming at all. Usually, wide-legs are very long. I either need to hem it or wear heels. I’m wearing slingback flats. These pants were a lucky find! Also, how cute are my Lisi Lerch earrings? I’ve been eyeing a similar pair at Anthropologie, but they immediately sold out. So when I had the opportunity to get a pair from Lisi Lerch, you bet I immediately said YESS! The floral design is so cute and unique! The timing of this post could not have been more perfect because pink and red scream Valentine’s Day as well. And you are correct, I will wear it for Valentine’s Day! Every Valentine’s Day outfit I have been coming across was made for warmer weather. Snow is currently falling as I type this so wearing a dress is a big no right now. Plus, I like how this outfit doesn’t look overdressed. We aren’t going anywhere fancy. We are still right around the neighborhood. There’s a new Indian restaurant that just opened, and I figured why not use Valentine’s Day as an opportunity to try it out? 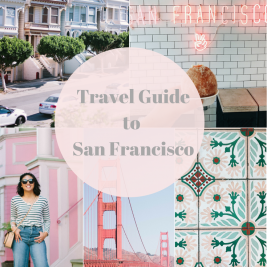 It’s only a few blocks away! What are your plans? I love this outfit so much!! Love the pants a lot! You’re bringing the spring vibes and I LOVE IT! So ready for some warmer weather! Aw thanks Ashley! I’m so ready for Spring! Omg! Es un look perfecto para San valentin 🙂 Las gafas son lo más!! Muackas!! 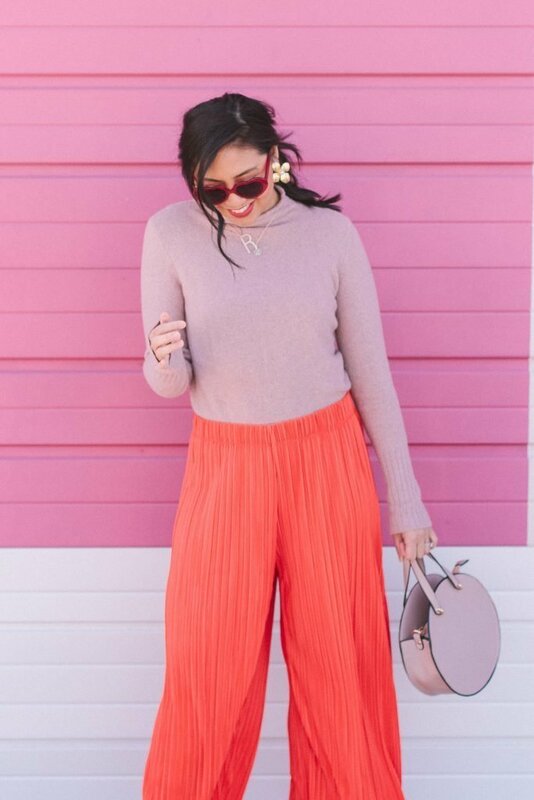 Oh my gosh these pants are SO fun and the perfect transition piece! LOVE! You can wear it for both! I love those pants, they are fabulous!! Thanks Cathy! I plan on wearing both! Yes to the Spring vibes with dem pants. Oh myyyy….I love it a lot. I wouldn’t mind wearing this on Val’s Day. You look great! You are such a pretty Valentine! Love the red pants. You are too sweet Greta! Both! I’m loving these bold colors! You pull off these pants SO well! Thank you Dorie! It is a fun Spring color combo! Those pants make me so happy!! I loved this look when you posted it to IG! Such a great color combination and makes me ready for spring. Thank you so much Anna! That means a lot! This outfit is SO fun and I love those pants! I am LOVING those pants, both the style and color are super cute! 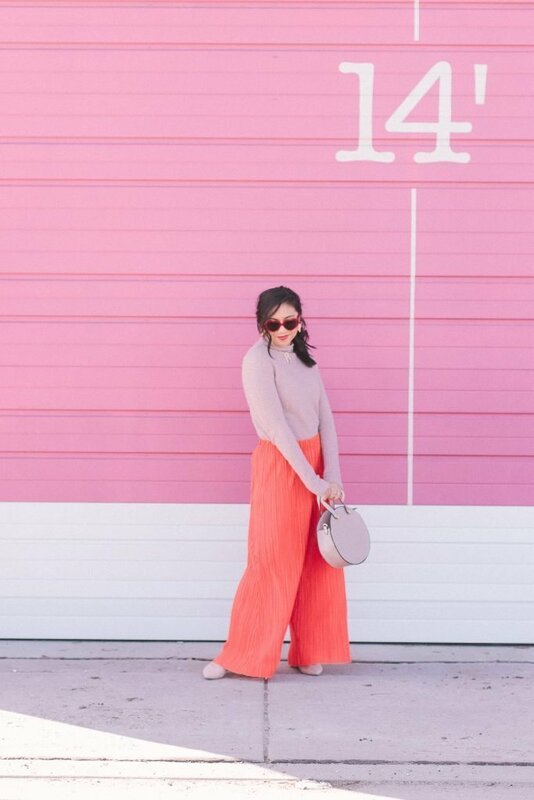 Love the wide-leg pants and the light pink circle bag! This is a great look and you look beautiful in it! And yes it can definitely be a perfect outfit for Valentine’s Day. those pants are so fun! cute outfit! Well this is just too fun! 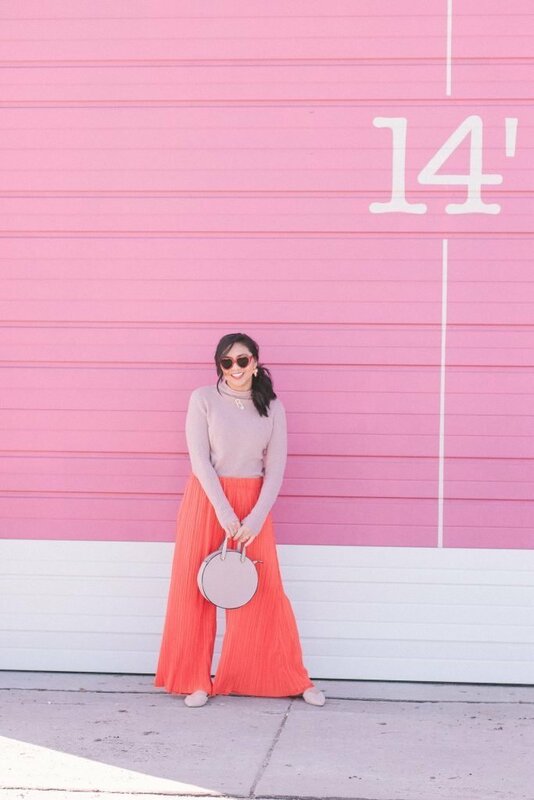 I love the color combo, your wide leg pants, and the fun wall! Perfect for this time of year and Valentine’s day! 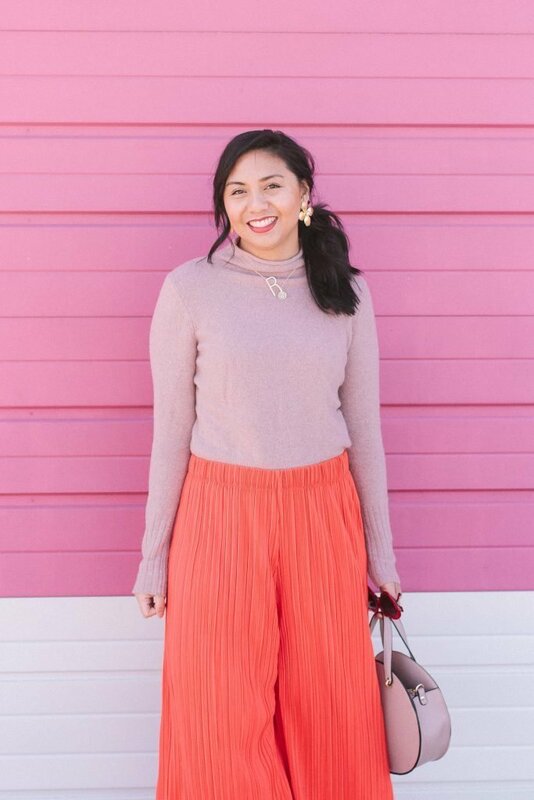 This is such a cute Valentine’s Day outfit! I loooove the flared and relaxed pants, and I could definitely see it as a great restaurant outfit. Thank you Inna! I think so too! Okay this is one of the cutest looks I have ever seen! Obsessed with this color blocking on you! Aw thanks so much Laura Leigh! Oh I love this look! We never do much on Valentine’s Day but we will probably have a little date this weekend. Hope you have a wonderful Valentine’s Day! That’s sound fun! Something to look forward to! I absolutely love the colors of this look dear! 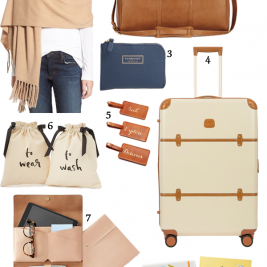 Cute colors, and relaxed look.